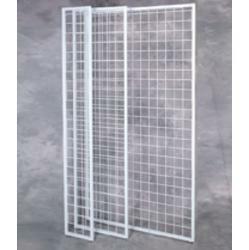 These gridwall panels are framed with a metal tubing, allowing the to remain free standing in a stand, or connected together to form a unique retail display of your making. Frames are sturdy and can be used to separate different products or put together to form an entirely separate gridwall "room." Available in three sizes and four colors.